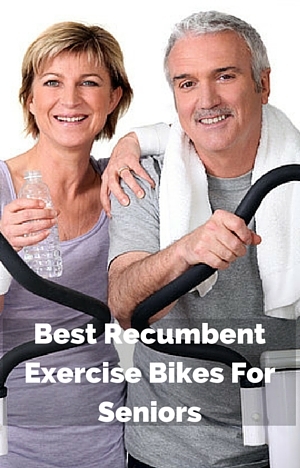 These top 3 best recumbent exercise bikes for seniors have been selected after spending a number of hours researching bikes. There is a lot of bikes out there which can make it difficult to know which ones are right for you. Also with many of them you have to spend hours digging to find out information about the bikes. I’ve done all this to put together this list to help make it easier to find a bike that can help seniors get good exercise. Recumbent exercise bikes can make a great choice for seniors (as well as anyone else) wanting a low impact cardio workout. They’re easier on the joints, provide good support for the back and you don’t have to balance yourself on a small bike seat. There is a wide range of prices and features with these bikes so to determine this top 3 best recumbent exercise bikes for seniors I’ve selected them in 3 different price ranges. In this way there should be a bike that will be suitable for all no matter what they want to spend on a recumbent bike. This bike has a good step through design making it easy to get on and off the bike. The resistance goes from very easy to moderately hard which suits most people other than those wanting very tough workouts. The seat is reasonably comfortable although some do need a small cushion or folded up towel. The backrest has fixed angle that most people find provides good support for the lower back (again some find they need a small cushion). Some people do find the seat adjustment a little difficult due to their being 3 knobs to use to do this. If you’re not changing its position often then it won’t be a concern. The handlebars at the side of the bike do come up above the height putting them at a good height to rest your hand on them. Reviews from seniors have said they find the bike comfortable and they get a good workout that is gentle on their joints. Read my full review here. This bike offers a much better range of resistance with 20 levels going from easy to very hard and has 22 pre-set workout programs you can follow along to. It provides good variety. You can if you want upload the information to a fitness account to track your progress. It also has a step through design making it easy to get on and off the bike and has handlebars at the front of the bike which can help with support when getting on and off the bike. There are handlebars at the side and level with the seat for support and they don’t get in the way if you want to slide on to the seat sideways. The pedals have straps to help to keep your feet on them as pedal. It has an easy continuous scale of adjustment for the seat where you use a lever and slide the seat into place. Unfortunately, it is advised that you are off the bike when you make the adjustment. The seat and backrest aren’t padded but are contoured and vented. Even though you are sitting on plastic many do find it a comfortable seat. Those that don’t find a small cushion helps to give the padding needed and support to lower back. Despite the name this bike isn’t just for those that want to do triathlons – people of any fitness level can use it to get the workout of the intensity they want. This bike has a lot of great features. You can be on the bike when you adjust the seat position making it very easy to get the sizing just right. It has a large padded seat that is soft but provides the support needed to reduce pressure points on your sit bones to make it as comfortable as can be. The back rest angle can be positioned at 3 different angles to get most comfortable position (you have to be off the bike to do this). For those that want to track their workouts it has a Fitness App that you can use with your mobile device to control your workouts instead of the console as well as track your performance over time. The console is backlit and can be tilted to make it easy to see. It includes speakers and fan. You can just get on and pedal away if you want or you can follow along to one of 22 pre-set programs that can cater for all abilities. I looked for a number of things to make sure the bikes were suitable – how comfortable was the seat, can it be adjusted easily to fit different heights, easy to use console, smooth pedaling motion, pedal straps , back support, easy to assemble, that there is no need to step over the frame or jump up into seat, its quiet and that the bike is durable. In selecting these bikes I went through their manuals, checked the specifications and features, asked questions of the supplier and also read through hundreds of customer reviews (checking reviews from seniors in particular) to determine the bikes that should make it on to the list. I then ranked the bikes by price range looking at their features and specifications to determine which ones should make the cut to be present here. There was some compromise on this for the under $200 category in particular the seat adjustment – where you need to make three adjustments each time you want to move the seat – it’s more annoying than difficult. It is still a good reliable bike with a comfortable seat and backrest with a smooth pedaling motion. Recumbent exercise bike are a great way for people of different abilities, ages (not just seniors) to get a good cardio workout that is comfortable, good back support and low impact. The seating arrangement can also help with those that have a problem with balance. It’s also great that there is a wide range of different bikes that can cater for whatever they want to pay and that they can get a good workout from them. P.S. If you want a bike that you can exercise you arms too then see my post on best recumbent exercise bikes with moving arms. Indoors Fitness is a participant in the Amazon Services LLC Associates Program, an affiliate advertising program designed to provide a means for sites to earn advertising fees by advertising and linking to amazon.com.